Friday Links: Market Basket, War and Climate Change, etc. (1) Alejandro Reuss on Market Basket: I noticed that a Twitter account related to the low-wage worker organizing that is going on now, @LowPayIsNotOk, tweeted about a ridiculous article from Forbes arguing that the take-away from the return of Arthur T. Demoulas as CEO to the Market Basket supermarket chain is that good leaders know how to engage their employees’ volunteerism (Market Basket: The Power of Volunteerism And Employee Engagement). That inspired me to post the piece on Market Basket by my co-editor, Alejandro Reuss, in our current issue (our Annual Labor Issue): The Meaning of Market Basket: Can Workers and Employers Be “Family”? When I get around to it I’m going to reply to the tweet and say that although we are fans, we hope the group can get its economic reporting and analysis from somewhere besides Forbes. (2) David Mihalyfy on university adminiatrators’ looting pay: Great piece at the Jacobin website: Higher Education’s Aristocrats. We knew that university administrators’ pay was inflated, and that that’s related to inflated CEO pay, but by focusing on one institution (U. of Chicago) and giving concrete data and contextualizing the data, this piece does a great job of showing that high-pay for university administrators is a kind of looting. (3) Sheila Collins on war and climate change: Great piece at Truthout by Sheila Collins: War and Climate Change: Time to Connect the Dots. The piece starts with the juxtaposition of the bombing of Syria and Obama speaking at the UN about the dangers of climate change–with no acknowledgement that there’s any connection between militarism and climate change. The article goes on to document the connections–the ways they contribute to each other. Along the way she talks about how militaries are the biggest polluters–a point Bob Feldman made in D&S with a piece back in 2003, War on the Earth. (4) MIT study finds greener cement: Via SolidarityEconomy.net, a press release from MIT about a greener (and stronger) kind of cement, which would reduce by 50% the greenhouse gas emissions that cement apparently gives off. (5) Grand Rapids ArtPrize festival: Via our pal Hillary Rettig, the internationally known community art festival in Grand Rapids, Mich. (hometown of Gerald Ford? ), ArtPrize, was “surprisingly political!”. 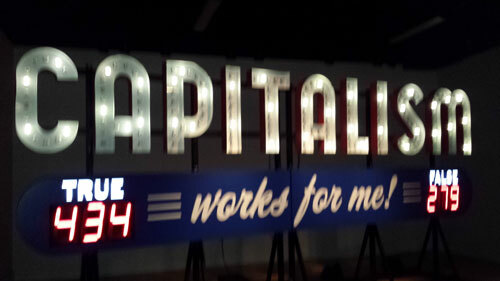 It included that traveling “Capitalism Works for Me!” sign/poll that we have covered on this blog (though judging by the photo Hillary sent, maybe Gerald Ford’s ghost still has a grip on Grand Rapids? ).